Dhaka, Dec 10 (Just News): Two people, including a woman, were killed and 12 others injured in a road accident on the Dhaka-Tangail highway in Soratoil area in Kalihati upazila on Sunday morning. The identities of the deceased could not yet be known. 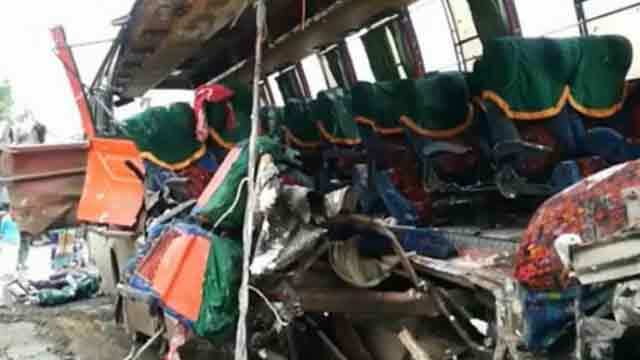 The accident took place around 8:00 am when a Dhaka-bound bus from Rangpur collided head-on with a truck coming from the opposite direction, leaving two dead on the spot and 12 others injured, said Asabur Rahman, officer-in-charge of Bangabandhu Bridge East Police Station. The injured were taken to Tangail Medical College Hospital.